The Hobart 5400 is a mobile Gasoline-driven 400 Hz 115/200V Ground Power Unit. 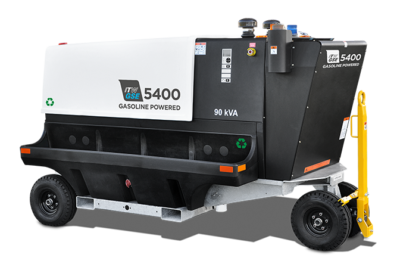 The 5400 Series is powered by a Ford V-10 6.8 L Gasoline engine coupled to 60Hz generator powering 2400 solid state converter. A Sliding canopy made of durable lightweight Polyethylene provides easy access to the engine, generator and control compartments. With the new easy to use color digital display allows the operator to scroll through data at the push of button. USB connectivity allows the user to download software updates in the field and allows for easy troubleshooting. The Hobart 4400 is available in 90kVA with the optional 28.5 VDC Module and dual 400Hz outputs.